Hybrids are great riding bikes! If you like the trails, but really enjoy riding the streets of your neighborhood, then take a look at the offerings from this category. There are models that offer the bare basics, and then we have the super lite flat bar hybrid. Hybrid Bicycles or "cross" bike as they are sometimes called originated at a time when most people buying a bike were buying a mountain bike, but often a mountain bike was simply too heavy and slow for the average rider. Bike companies took the best elements from mountain bikes, tourers and racing bikes and built a bike which met the requirements of the average rider, and they called it a "Hybrid Bicycle". You can choose from a step-through frame or a traditional diamond frame and available in multiple frame sizes. Most importantly, you can ride a hybrid over most surfaces excluding severe off-road conditions. The rider gets the best of both worlds . . . perfect blend of speed and comfort. A hybrid is fitted with 700c wheels (the same diameter as fitted to racing bikes) but with wider tires and rims (on average 35mm). These tires are generally multi condition. They have a smooth center line for efficiency on road, but have a knobbly outer tread, to give good traction if the bike is ridden on a trail or unpaved surface. Hybrid bikes are usually fitted with the same gear systems as mountain bikes, with between 21 and 27 gears, and similar braking systems. Some of the higher end Hybrids are equiped with road bike gearing, making them a very popular choice for the tourist, and casual club rider. 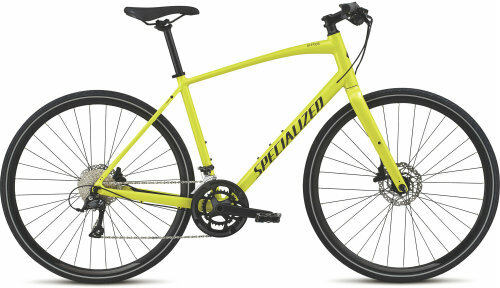 A hybrid will have three front chain rings like a mountain bike instead of the two that is more typical of a road bike. A hybrid will have handle bars that are straight or sweep up, like a mountain bike instead of drop down bars like a road bike. 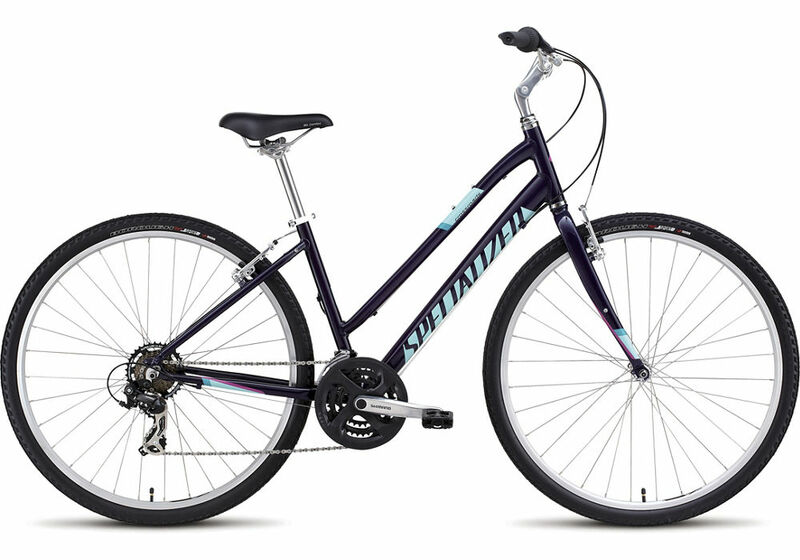 Hybrids combine the narrow tires and high-ratio gearing of road bikes with the comfort and style of a mountain bike. A road bike usually has a steeper sweep angle on the front forks which gives it a longer wheel base than a hybrid. Shocks are common option available on the hybrid bike. The weight of a hybrid is also usually somewhere in between the lighter road bike and heavier mountain bike. Lightweight, offering a wide range of gears. Doesn't have the "drag" on the road that you get with a mountain bike. One of the best all around bikes there is- suits the majority of riding. Not suited for severe off-road conditions or mountain tracks etc. Stick to well worn tracks and paths. Hybrid bicycle combine the features of mountain and road bikes. A road bike is fast and a mountain bike is durable, but the hybrid is perfect for a wide variety of uses: bike paths, getting your groceries, fun rides and commuting.